Dark Brown Wool Blazer by L.B.M. If you're scouting for a casual yet seriously stylish outfit, go for a L.B.M. lbm 1911 classic fit cotton wool blazer and beige skinny jeans. Both pieces are totally comfortable and will look great paired together. Make dark brown leather loafers your footwear choice for a masculine aesthetic. Contrary to what you might believe, outfiting on-trend doesn't take that much a work setting. 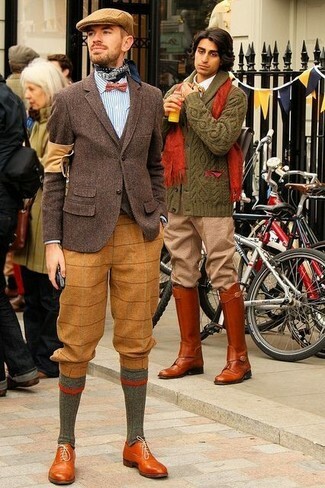 Just wear a dark brown wool blazer and white chinos and you'll look amazing. Sporting a pair of brown leather derby shoes is a simple way to add some flair to your outfit. For a nothing less than incredibly stylish ensemble, make a L.B.M. lbm 1911 classic fit cotton wool blazer and charcoal wool dress pants your outfit choice. Tan leather brogue boots will add more playfulness to your getup. 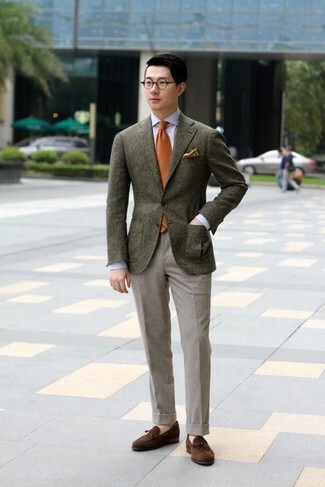 For a nothing less than incredibly stylish look, wear a dark brown wool blazer with grey wool dress pants. 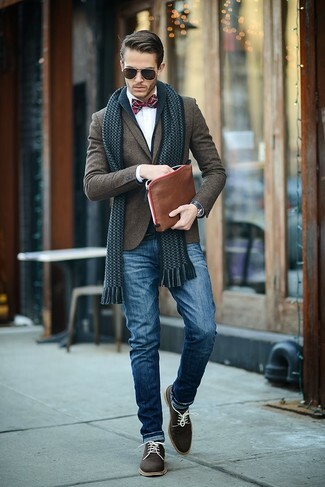 For something more on the daring side to finish off this getup, opt for a pair of dark brown suede tassel loafers. 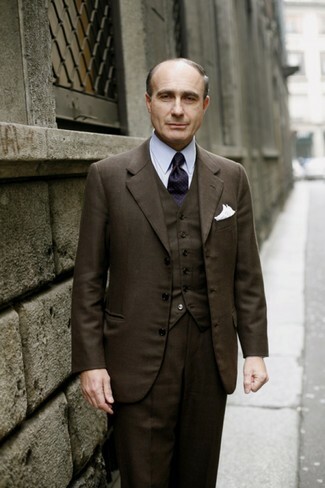 For a nothing less than incredibly stylish getup, pair a dark brown wool blazer with dark brown wool dress pants. As you can see here, being a dapper dude doesn't take that much time. 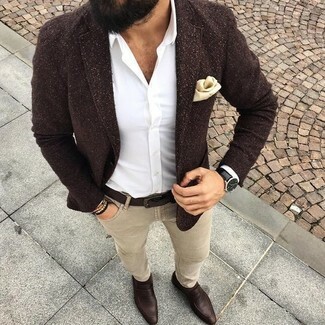 Just consider wearing a dark brown wool blazer and blue jeans and you'll look incredibly stylish. Kick up the cool of your outfit by completing it with dark brown suede oxford shoes. Wear a dark brown wool blazer and brown plaid wool dress pants to ooze class and sophistication. Bump up the cool of your getup by rounding it off with tobacco leather oxford shoes. For a smart casual getup, consider wearing a L.B.M. 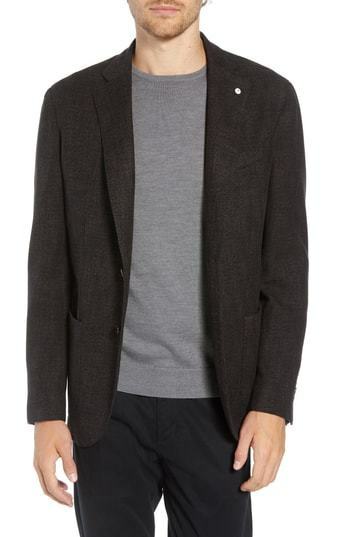 lbm 1911 classic fit cotton wool blazer and black jeans — these items go perfectly together. 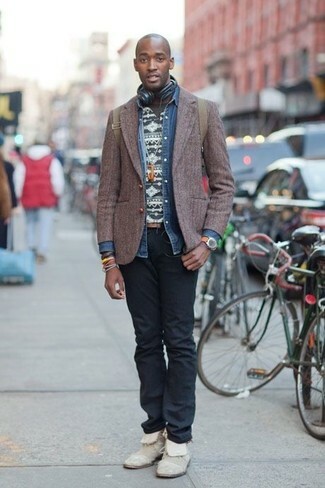 When it comes to shoes, this outfit is round off nicely with grey suede desert boots. For a casually elegant outfit, team a dark brown wool blazer with black jeans — these two items play beautifully together.